In 2003 our family relocated to Folsom, California from Carson City, Nevada, after my father-in-law was diagnosed with Parkinson’s disease, to help with his care. In many ways the transition felt like an immersion into what Joel Kotkin calls the “city of aspiration.” Folsom, a Sacramento region suburb of 50,000, was notable for its robust economy, impressive K-12 schools, world-class bike paths, and low crime. It offered a favorable environment for families and upwardly mobile professionals. Seven years later, the landscape has certainly changed. My father-in-law has passed on, and California's high cost of living continues to have a profound impact on our personal finances. This scenario, coupled with the currently dire economic picture, gave my wife and I pause to again rethink our future path. After many long nights of thoughtful dialogue, we came to the realization that it was time to break ties with the Golden State. In early summer, Denver will become our next home. This pending relocation offers our family an opportunity to embrace what I call “the geography of place”— the merging of what one wants to do with where one wants to live. As a process, it embodies a deep exploration into our values and upbringing, hopes and fears, past and future. And while a move of any distance can be daunting, it’s this deeper journey of self that makes the experience rich and meaningful. Our plans come at a time of decline in nationwide domestic relocation. Prominent demographer William Frey, in conjunction with the Brookings Institution, led a recent study on migration trends. He found that in 2007-08, the overall U.S. migration rate reached its lowest point since World War II, particularly for long-distance moves and renters. His study also indicated that migrations to exurban and newer suburban counties dropped substantially, simultaneously bringing unanticipated population “windfalls” to many large urban centers. The overall rate of decline is largely attributed to the economic slowdown crippling many parts of the nation, leading to job and income loss as well as upside down mortgages. 1. Culture: Our ideal environment should have a rich, culturally diverse set of demographics. As a biracial family, social acceptance in our community is paramount. 2. Charm: Our perfect residential picture is a neighborhood that represents a hybrid of walkable urbanism, housing affordability, safety, and community, which are often found in more suburban environs. 3. Community: We both enjoy opportunities for civic connection. Proximity to hubs of social connection – such as coffee houses and universities – is a must. 4. Convenience: By choice we are a one-car household, which makes bicycle, light-rail and walkable accessibility to centers of city activity and conveniences key. 5. Climate: As a native Midwesterner married to a Southern Californian, we found common ground in a locale offering a change of seasons with generally moderate temperature. The upshot of our vetting process had some correspondence with a recent Best Cities for a Fresh Start list compiled by relocation.com. Topping that list is Austin, Texas, an impressive city that I recently visited as a part of my urban research study tour. The Dallas/Ft. Worth area came in second, followed by Charlotte, North Carolina. Denver was fourth, with Columbus, Ohio (my hometown) and Indianapolis tying for fifth on the list. Portland, Oregon: This Pacific Northwest jewel has received much media attention for its progressive urban practices. And for good reason. It boasts strong community and civic vibes, great neighborhoods, a transportation system ranked among the best in the nation, and a hip, urbane population base. In the end, though, the overcast, rainy climate was too much to overcome in a transition from ever-sunny California. Boise, Idaho: Despite concerns about Boise's diversity, the area has extremely low housing costs. 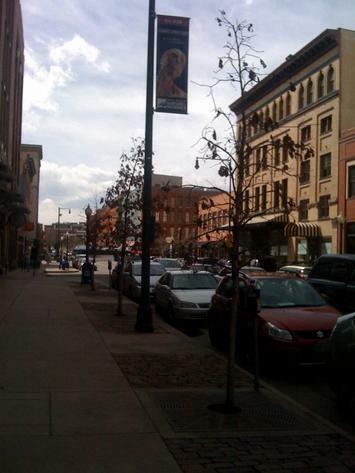 Its strong university presence (Boise State) and vibrant downtown were also appealing. On the downside, the airport would have posed some travel limitations. Moreover, the area lacks the depth of social and cultural options common in more urbanized settings. Indianapolis, Indiana: Having lived in the Indianapolis area in the early ‘90s, this state capital has always held a special place in my heart, with its strong African-American communities, myriad array of spectator sports, and low cost of living. While I'll always be a Hoosier at heart, the advantages of this Midwestern city were outweighed by its bleak winter climate. My wife’s need for sunshine booted it out of contention. And then there was Denver. Denver, our city of choice, impressed us with its myriad quality-of-life intangibles. While not on the order of California, it is culturally diverse with a strong sense of civic vibrancy. The area offers a wealth of housing options that fit our parameters: semi-urban, walkable, affordable, and safe. Culturally, the city has a young, active vibe to it. People are involved in varied outdoor activities and events, which underscore the recognition of Denver as one of the most physically fit cities in the U.S. Many have also described it as unpretentious. It has a progressive political structure, as well as a strong economic development platform for the future. With a population of nearly 600,000, Denver is the 24th most populous city in the U.S. and the 16th most populous metropolitan area in the nation. Geographically, it's located in the center of the U.S., nestled in a mountain range that makes harsh cold weather and winds a rarity. While the city gets its fair share of snow, the winter months are rarely bleak. In fact, a draw for many residents is the 300-plus days of sunshine the city receives each year. We stand to gain immeasurably moving from über-expensive California. And in terms of intangibles, several are prominent. We're looking to capitalize on Denver's new urbanist-influenced walkability. The city has lots of options, from the hip and trendy Lo Do District to the established community of Capitol Hill. A key requirement of our ultimate housing choice will be a quality school district, along with proximity to transportation, coffee houses, grocery stores, fine dining venues, and even co-working sites. In our current residence in Folsom, California, it's a challenge to stroll by foot to area amenities. As intellectually inclined individuals, it was also exciting to find that Denver holds the distinction of being the most educated city in the U.S. with the highest percentage of high school and college graduates of any U.S. metropolitan area. According to census estimates, 92% of the metro area population has a high school diploma, and 35% has at least a bachelor’s degree, compared to the national average of 81.7% for high school diplomas and 23% with a college degree. And finally, as a former resident of Indianapolis, a city that fed my obsession for spectator sports, Denver's robust athletics scene certainly raised my heart rate. The hub of professional franchises in football, basketball, baseball, and hockey, it is one of the nation’s top sports meccas. It has certainly sparked a picture in my mind of hanging out at sporting events, beer in hand, enjoying the scene. In the end, relocating to a new geographical locale is never smooth. It requires a great deal of thoughtfulness, conversation and patience. My family views it as the ultimate “Mile High” climb for higher ground amid the economic unsettledness currently affecting California. If well-orchestrated, the payoff will be significant: a better quality of life and a rich existence. That's our hope; that’s our goal for 2010. Submitted by sanorient2 on Sat, 06/07/2014 - 04:43. Submitted by sanorient2 on Sat, 05/31/2014 - 02:15. Submitted by markj2911 on Fri, 01/10/2014 - 07:50. To relocate from one place to other is always a terrible experience for all family members regarding emotionally or physically. When i was in Edinburgh, Removal company helped me a lot to relocate. You can visit them and hire them for your next relocation in Edinburgh. Submitted by asadalikhatrint on Sat, 10/19/2013 - 06:13. Submitted by alexmargarate on Mon, 09/09/2013 - 03:48. Submitted by jackmathewto on Fri, 06/28/2013 - 06:24. Submitted by muzzo on Tue, 06/25/2013 - 07:11. Submitted by Maroon6 on Fri, 06/29/2012 - 21:08. Hope all is going well with you and your family in Denver. Well adjusted now? We are a newly married couple when we moved to Denver and found a new hobby, biking. :) Lots of parks and great biking trails here, the climate is also perfect for such. During winter time, there are skis of course. Currently, we're enjoying our stay here and thinking of making it permanent. I guess corporate relocation isn't so bad after all as what we first thought it would be. Submitted by max.leonetti on Sun, 06/12/2011 - 19:27. I had the opportunity to stay in Denver for three months, I have to travel a lot and moving box with my stuff all over the world is part of my life. My life in ten boxes would be my nickname. I liked the transportation system in Denver, some small problems in downtown but overall a good structured city. I observed a lot of young people giving the city a young, fresh, energetic image. I congratulate you for your decision.